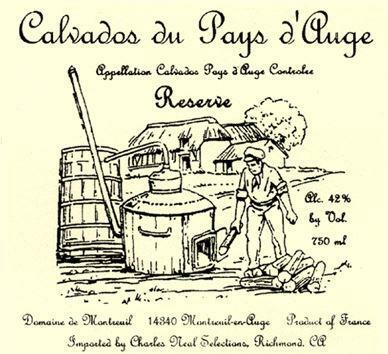 This project is a collaborative effort between Charles Neal and Patrice Giard that began in 2006 at the Giard family's Calvados estate--located in the Pays d'Auge sub-region (considered the best area for Calvados). While the two were working on that year's distillation, they began to taste through different barrels together, gradually hatching a plan to create the best possible combination of the younger spirits. The result is a blend with an average age of seven years: 30% from barrel #38 (distilled in 1998), 40% from barrel #32 (distilled in 2000) and 30% from barrel #4 (distilled in 2003). Patrice Giard, the current proprietor of Domaine de Montreuil, can trace his family in the region twelve generations back to the 1700's. The family has 30 hectares (74 acres) of orchards, planted entirely in the traditional, free-standing haute-tige method, making for a total of about 3,000 trees. As with preceding generations, Giard waits for the fruit to fall, then collects it after it has been on the ground. The cider ferments sur lie in well-seasoned tonneau and stays in the large barrel for one year prior to distillation. After being double-distilled, the new spirit goes into a variety of well-seasoned oak casks. Giard prefers to refinish the ends of some barrels than buy new wood. Patrice empties and refills the barrels every couple of years, gradually reducing them with rainwater until they reach 42% alcohol. The apples are a mixture of the four categories: sweet, bittersweet, acidic and bitter composed of numerous include Domaine, Bedan, Fagotier, St. Philbert, Frequin Rouge, and the acidic Rimbault, Petit Jaune and Blanc Sur.